When Jon Simmonds felt the call to plant a church, he didn’t know what he was getting into. He didn’t necessarily follow the set play book for planters and his church, The Table, in St. Peters, Missouri, is not your average church plant. Jon had been in ministry for over a decade and was serving as a youth pastor when he felt led to plant a church. He gathered a team and they began meeting as a small group in January 2015. Just a few months later, the Table’s story starts to deviate from normal. In April 2015, a pastor in St. Peters, Missouri, contacted Jon and his team about using their building and becoming a legacy congregation to support The Table. After pursuing God, the Table assumed possession of the building and the congregations merged. Jon received funding from his state ministry to remodel the building and to get personally equipped as a pastor through assessments and coaching. Photo: The Table congregation and their building. The Table gutted the first floor of the building and created a table/restaurant atmosphere where they hold services on Saturday night. At their services, they always share a meal together. After eating, they have “The 120,” about thirty minutes of sharing short stories around a selected topic for that night. 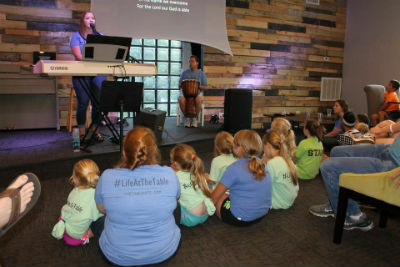 After a brief intermission, they worship together and the kids are dismissed for a children’s ministry called “The Kid’s Table” while Jon shares a lesson. After the gathering, everyone is invited to stay, hangout, eat dessert/drink coffee, for as long as they’d like, so that table-gatherers can purposefully engage in conversations that build community. The Table launched in August with over a hundred people in attendance! Their most recent event reaching out into their community brought ten new kids and their families onto the property for a neighborhood barbecue. But how did a group of five introverts go from a small group to a core of 25-plus to a launch of 100-plus? With God’s blessing and with help from others. Jon gives a lot of credit to the pastor of the legacy church. “The legacy gift has been huge. And Pastor Rory Romine’s leadership has been amazing. He led his congregation from a hunkered-down mentality to seeing the surrounding neighborhood as needing Jesus.” Read more about the merger story here. “Coaching has also been incredible.” says Jon. Being very introverted with a self-resourcing learning style, Jon went into his original coaching calls very nervous. “When I get off the calls, I am always energized and focused. On the calls, we don’t just talk about what I need this week, it’s also what I need next week and in the future to be a better leader.” Jon says his Healthy Growing Churches coach, Gary Kendall, is always looking ahead for him, preparing Jon for what is coming next, guiding their coaching conversations to build into the next conversation and topic. Jon has been working with Gary since May, and they haven’t just covered improving Jon’s leadership. Gary brings not just his own planting experience “to the table,” but also his experience in everything from leading a church through a building project, to practical resources that help a pastor stay organized to helping the introverts in the core group become gatherers. “The coaching experience has been invaluable. It gives me access to an experienced leader and I am not intimidated to ask questions.” says Jon. Heidi Tarin has served Healthy Growing Churches as communications catalyst. Article originally published by HGC News. Republished by permission. Learn more about Healthy Growing Churches at www.healthygrowingchurches.com. Learn more about the Church of God at www.JesusIsTheSubject.org. This entry was posted in All Church of God, Central and tagged church plant, church planting, coaching, Gary Kendall, Healthy Growing Churches, Heidi Tarin, HGC, Jon Simmonds, merger, Missouri, Rory Romine, Saint Peters, St. Peters, The Table. Bookmark the permalink.